After our article on the Whole Planet Foundation was posted, a woman from Whole Foods wrote an email in support of the blogpost and shared her story: "Liz Burkhart here from Whole Foods Market - I just wanted to write you a quick note and thank you for the great piece you all did on our Whole Planet Foundation! I just finished a volunteer trip in Kenya where we actually met microfinance partners in the field (more on the Foundation’s blog here: http://www.wholeplanetfoundation.org/blog/2011/07/kenya/) and I LOVE the work our Foundation is doing." Wow! We're honored by the fast reply from Whole Foods / Whole Planet, and the rest of the email was just as sweet. Liz also tipped us off to another non-profit: Comfort the Children International. Liz worked with the group in Kenya, where the organization helps Kenyans build and manage their lives, focusing on education, environment, economy, health, and community. The CTC team works hand-in-hand with the Maai Mahiu community to ask them what time, resources, and initiatives they need. CTC has helped the community through instruction on sustainable farming methods; teaching courses in tailoring, carpentry, leather works, cosmetology, computer skills, and knitting at the local schools; caring for children who are disabled; creating L.I.F.E. (Livelihood, Invest, Future, Environment) bags and jackets; opening a HIV/AIDS testing and counseling clinic; and designing a community center and soccer club. 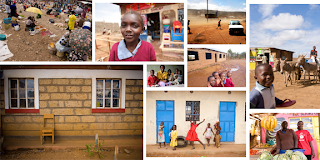 CTC International offers opportunities to get involved in Austin, Texas and Maai Mahiu, Kenya. Learn more about the volunteer trips and donation opportunities at their Join Us website.